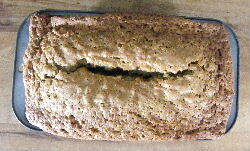 This zucchini bread is great as a dessert when you want a little something sweet after a meal, but we often have it for breakfast with a side of fresh fruit...and I find comfort in the fact that it contains a vegetable that my daughter is willing to eat. When she was little, I called it sweet bread. When I thought she could handle the truth about what the green stuff in the bread was, I told her it was zucchini, and she stopped eating it for a year. It was too good to stay away though and she is back to eating it. She often takes it to school and shares it with her friends. Now they love it too, so that should be a good testament to how delicious this recipe is. Grate the zucchini squash, including the peel until you have 2 cups full. In a large bowl, mix all the ingredients together until moistened. Grease your baking pan with butter or a non-stick coating spray. Pour the mixture into the bread pan and bake for one hour at 325 degrees. This recipe will make one loaf, so if you're going to double it (we usually do), use a really large bowl to mix the ingredients. Also, if you're making more than one loaf, this is one of those recipes where you really do double ALL the ingredients. Some recipes and some cooks, tell you not to double salt or some other ingredient, but in this recipe, you do want to double everything.